The battle continues. During my absense from the front to deal with matters in the rear of the lines, my 1st Bavarian division is repelled from the woods. The lead brigade of the 2nd division crosses the ford and enters the woods and is immediately embroiled in a firefight with Russian Jager battalions now formed up into lines. With lead regiment fresh and in column, I charge them forward into one of the Jager battalions which stands and forces me back a number of times. 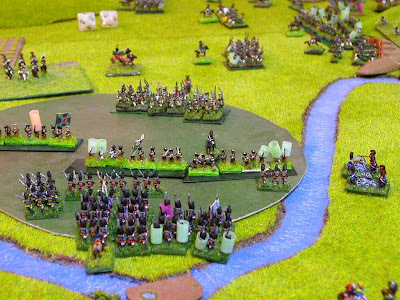 My troops are not too concerned at the setback and charge repeatedly trying to push the enemy from his position. Carefully sited artillery on my right now pounds the right side of the woods with fire, although how effective on the enemy that is I will not know. I manage to get another regiment across the ford and another battalion of light troops. With 5 battalions, I charge again and this time manage to force the enemy to retire. The Russians take a toll as 1 battalion flees and another is reduced to 50% capacity. Reinforcements are entering the woods from the Russian side. The contest for the woods is far from over as I see Russian reinforcements moving behind the woods. Once can reasonably guess they are intending to enter the fray. I'll see soon enough. On the right, Davout is having a hard time of it trying to get through the Russian positions. His clever use of skirmishers, artillery and cavalry is slowly making progress. But only slowly. A charge by French light cavalry on the extreme right flank manages to get into the Russian position only to find Russian cavalry waiting. A unit of cossacks flee but the remainder of the enemy cavalry remain.